This is a list of notable sausages. Sausage is a food usually made from ground meat with a skin around it. Typically, a sausage is formed in a casing traditionally made from intestine, but sometimes synthetic. Some sausages are cooked during processing and the casing may be removed after. Sausage making is a traditional food preservation technique. Sausages may be preserved by curing, drying, or smoking. Sai ua is a grilled pork sausage from Northern Thailand and Northeastern Burma. 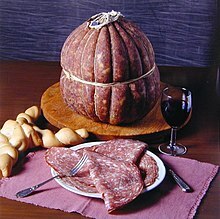 Winter salami is a type of Hungarian salami based on a centuries-old producing tradition. Kaminwurz or kaminwurze – air-dried and cold-smoked sausage (Rohwurst) made of beef and fatback or pork, produced in the South Tyrol region of northern Italy. Occasionally, kaminwurz is also made of lamb, goat or venison. The name of the sausage comes from the custom of curing the sausages in a smokehouse attached to the chimney up on the roof truss of Tyrolean houses. 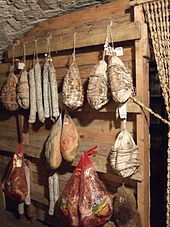 Salumi are Italian cured meat products and predominantly made from pork. Only sausage versions of salumi are listed below. See the salumi article and Category:Salumi for additional varieties. myśliwska - smoked, dried pork sausage. Doktorskaya kolbasa (lit. doctor's sausage) – predominant type of mortadella-type sausage closely resembling American-style, lard-less bologna; it was invented in USSR as a healthy food for people with stomach problems, and ended up dominating the Russian market for cooked sausages with high water content (so-called "boiled sausages" in Russia). According to the original Soviet state standard, it had to be made with pork, beef, eggs, milk, cardamom or nutmeg, salt and sugar. Sardelka – a small cooked sausage that is eaten like a frankfurter; it is, however, thicker than a typical frankfurter. A St. Galler bratwurst, schüblig and cervelat, cooked and served hot. Cross section of a Stornoway Black Pudding. It was granted Protected Geographical Indicator of Origin status in May 2013 by The European Commission. Battered sausage – similar in concept to a corn dog, but normally not served on a stick. Found all across the United Kingdom, Ireland, Australia and New Zealand. Gloucester sausage – made from Gloucester Old Spot pork, which has a high fat content. Knoblewurst - a Jewish delicacy: "a plump, beef sausage that’s seasoned with garlic." ^ Lapidos, Juliet (8 June 2011). "Vegetarian Sausage: Which imitation pig-scrap-product is best?". Slate. ^ Hempstead, A. (2017). Moon Atlantic Canada: Nova Scotia, New Brunswick, Prince Edward Island, Newfoundland & Labrador. Travel Guide. Avalon Publishing. p. pt171. ISBN 978-1-63121-486-8. Retrieved 23 October 2017. ^ ToldrÃ¡, F. (2010). Handbook of Meat Processing. Wiley. p. 391. ISBN 978-0-8138-2096-5. Retrieved 23 October 2017. ^ Steves, R. (2017). Rick Steves Berlin. Rick Steves. Avalon Publishing. p. pt606. ISBN 978-1-63121-694-7. Retrieved 23 October 2017. ^ Sheraton, M. (2010). The German Cookbook: A Complete Guide to Mastering Authentic German Cooking. Random House Publishing Group. p. pt396. ISBN 978-0-307-75457-8. Retrieved 23 October 2017. ^ Long, L.M. (2015). Ethnic American Food Today: A Cultural Encyclopedia. Ethnic American Food Today. Rowman & Littlefield Publishers. p. 277. ISBN 978-1-4422-2731-6. Retrieved 23 October 2017. ^ Phillips, A.; Scotchmer, J. (2010). Hungary. Bradt Guides. Bradt Travel Guides. p. 373. ISBN 978-1-84162-285-9. Retrieved 23 October 2017. ^ Publishing, DK (2012). Sausage (in German). DK Publishing. p. 34. ISBN 978-1-4654-0092-5. Retrieved 25 September 2015. ^ "Kaminwurzen – smoked dry sausages, pack of 3". Metzgerei Mair. Metzgerei Mair. Retrieved 18 September 2015. ^ Wadi, S. (2015). The New Mediterranean Table: Modern and Rustic Recipes Inspired by Traditions Spanning Three Continents. Page Street Publishing. p. 193. ISBN 978-1-62414-104-1. Retrieved 22 October 2017. ^ Khalifé, M. (2008). The Mezze Cookbook. New Holland. p. 10. ISBN 978-1-84537-978-0. Retrieved 22 October 2017. ^ "Banat Sausage". Radio Romania International. 23 October 2017. Retrieved 23 October 2017. ^ Handbook of Fermented Meat and Poultry. Wiley. 2014. p. 245. ISBN 978-1-118-52267-7. Retrieved 23 October 2017. ^ Allen, G. (2015). Sausage: A Global History. Edible (in German). Reaktion Books. p. pt115. ISBN 978-1-78023-555-4. Retrieved 23 October 2017. ^ Sinclair, C. (2009). Dictionary of Food: International Food and Cooking Terms from A to Z. Bloomsbury Publishing. p. pt1179. ISBN 978-1-4081-0218-3. Retrieved 23 October 2017. ^ "Stornoway black pudding given protected status". BBC News. 8 May 2013. Retrieved 26 March 2014. ^ Country Life. Country Life, Limited. 2000. p. 53. Retrieved 23 October 2017. ^ Sinclair, C. (2009). Dictionary of Food: International Food and Cooking Terms from A to Z. Bloomsbury Publishing. p. pt571. ISBN 978-1-4081-0218-3. Retrieved 23 October 2017. ^ Webb, A. (2012). Food Britannia. Random House. pp. 120–121. ISBN 978-1-4090-2222-0. Retrieved 23 October 2017. ^ "Britain's Best Baker judge urges menu simplicity". The Morning Advertiser. 19 May 2014. Retrieved 23 October 2017. ^ Finney, T.B. (1908). Handy Guide: For the Use of Pork Butchers, Butchers, Bacon Curers, Sausage and Brawn Manufacturers, Provision Merchants, Etc. T.B. Finney. p. 67. Retrieved 23 October 2017. ^ Carr, David (16 January 2009). "A Monument to Munchies". The New York Times. Retrieved 4 May 2010. ^ Bruni, Frank (30 May 2007). "Go, Eat, You Never Know". Retrieved 26 July 2017. This page was last edited on 27 March 2019, at 23:28 (UTC).